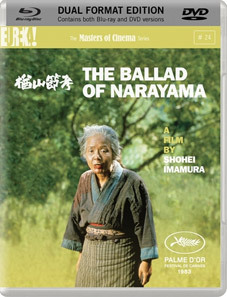 Cinematic anthropologist extraordinaire Shōhei Imamura won his first Palme d'Or at the 1983 Cannes Film Festival for The Ballad of Narayama (Narayama bushikō), his transcendent adaptation of two classic stories by Shichirō Fukazawa. The film also marked Imamura's third collaboration with celebrated actor Ken Ogata, following the 1979 Vengeance is Mine (Iwao Enokizu) and the 1981 Eijanaika. Creating a vividly realised inverse image of "civilised" society with typical directness and black humour, Imamura presents a bracingly unsentimental rumination on mortality and an engrossing study of a community's struggles against the natural elements. Handled with a masterful control and simplicity, moving effortlessly between the comic and the horrific, The Ballad of Narayama is one of the legendary director's deepest, richest works, and ranks among the finest films of its decade. The Ballad of Narayama will be released on UK dual format (containing DVD and Blu-ray versions) by Eureka as part of the Masters of Cinema series on 24th October 2011 at the RRP of £23.48. A lavish booklet featuring an interview with Shōhei Imamura, excerpts from the producer's on-set diary, rare promotional material and stills, and more!